We roasted stuffed s’mores with Kevin Allison of The State and Risk! “Messy, but good,” indeed, young avatar of baseball-playing baby-boomer wistfulness. But what if s’mores were messy, good, and infused with additional confectionary notes like mint, peanut butter, and additional chocolate? 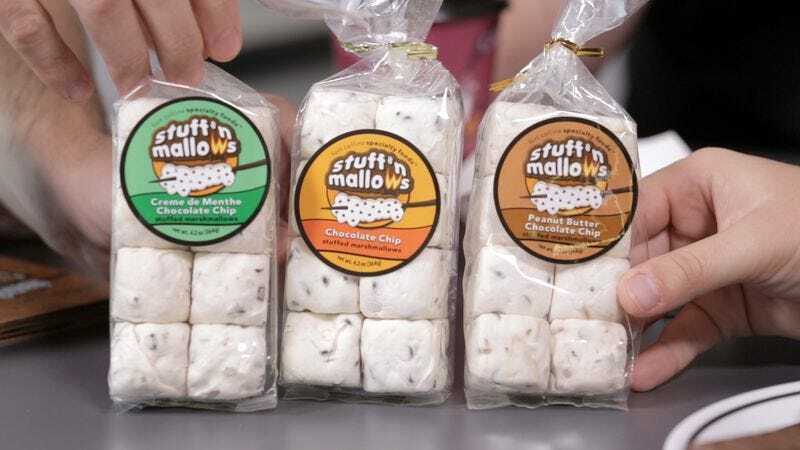 That appears to be the main motivation behind Stuff’n Mallows—that and the fact that three students at Colorado State University wanted to make sure no camper or backyard reveler would ever again eat a s’more with cold chocolate. As such, they’ve embedded the candy in the marshmallow, ensuring that it will melt in concurrence with the sugary sponge of the marshmallow. Now, the staff of The A.V. Club could’ve just eaten the Stuff’n Mallows we received without heating them up and sandwhiching them between graham crackers, but that would be disgusting, and only the most desperate of sugar fiends would ever eat a raw marshmallow. (Full disclosure: The author of this piece has eaten raw marshmallows on multiple occasions, even though he knows it’s disgusting.) Instead, associate editors Erik Adams and Marah Eakin ignored the parts of the Onion Inc. employee handbook regarding open flames in the office, inviting Kevin Allison—host of the Risk! storytelling podcast and a member of the revered comedy troupe The State—to join us in our afternoon snack/flagrant disregard of company policy. And since we were being so reckless, we went ahead and piled more candy on top of our Stuff’n Mallows, like the Reese’s Peanut Butter Cup Allison added to his s’mores concoction. If you’d like to ask Allison about this molar-rattling experience, you can catch him at one of Risk’s upcoming live shows (dates for which can be found here). In the meantime, please don’t tell HR we lit three separate fires in the conference room.